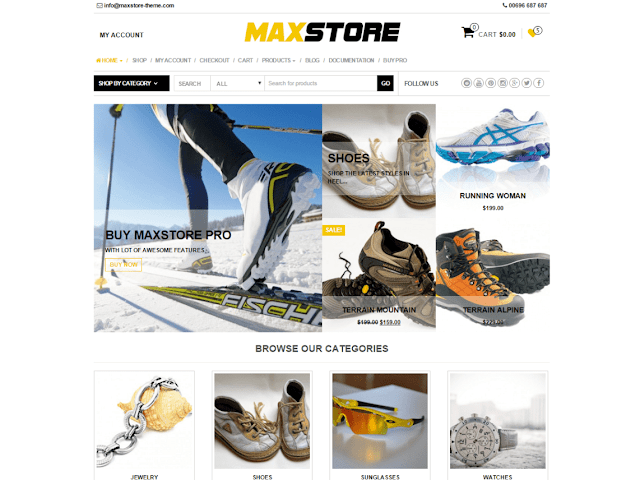 #MaxStore is free #WooCommerce #WordPress #Theme. MaxStore is WordPress #eCommerce theme based on WooCommerce plugin. This theme will be a perfect choice for online #fashion store, sport store, digital shop, men or women store, handbags store, cosmetics shop, luxury jewelry, accessories store and multipurpose online stores. Built with Bootstrap and CSS3 this creative theme is fully responsive design ready for the perfect look on any device. Theme is fully translation ready and includes wishlist support, left or/and right sidebar, footer widget area, custom backgrounds, custom logo, info top bar, search bar, social icons and much more... MaxStore is the fastest WooCommerce theme for WordPress.